Keele & Dundas Sts. looking West, West Toronto, Canada. From a contemporary postcard. 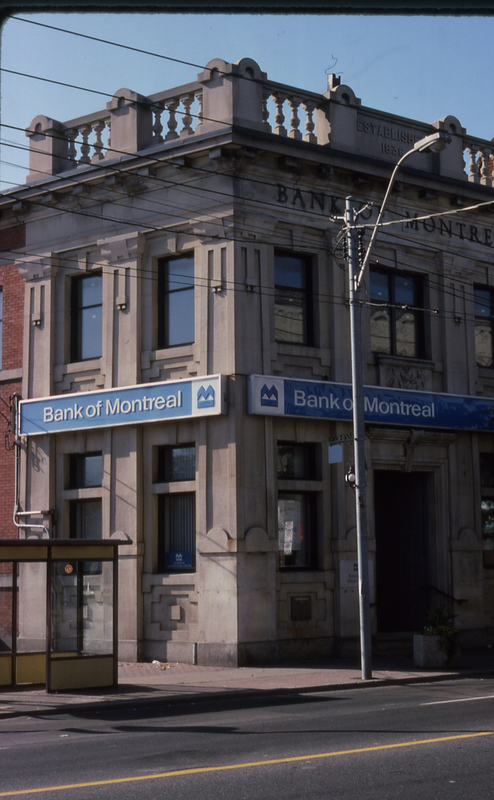 This intersection was once the centre of Junction commerce, with banks at or near three of the corners, including the Bank of British North America building (now the Bank of Montreal) at 2859 Dundas Street West, which was designed by Ellis and Connery in 1907. It has Beaux Arts elements in its design, with an elevated main floor and high ceiling. 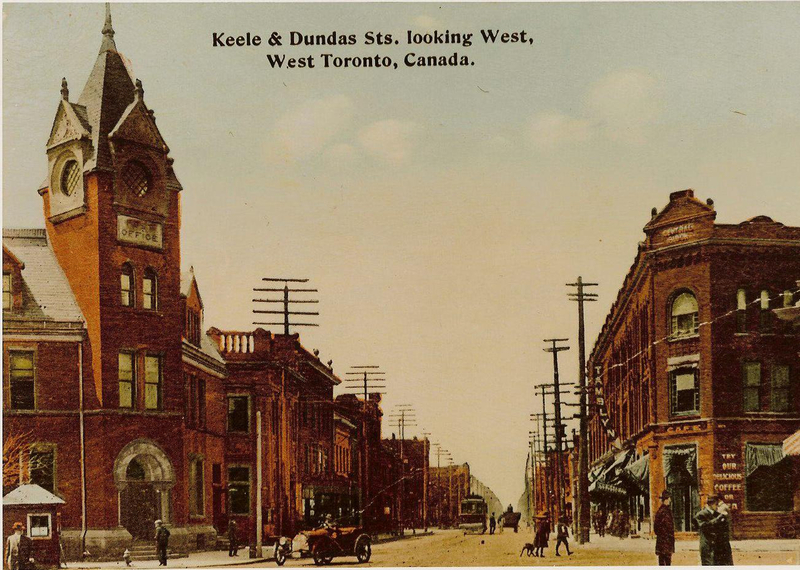 The parking lot next door was, for many years, the site of the Junction’s customs house and main post office, serving as a port of entry where Junction businesses could clear their goods. semi-circular shape at base of pilaster appears to be a cap to a short base element that the pilasters rest upon. This same shape appears in the odd shaped cap of the roof-top pillars that support the balustrades and guard rail. It is unusual to have a vertical element resting on a semi-circular shape like this, so did the architect want us to see another meaning in the semi-circular shape? Is it a plan of a semi-circular pilaster attached to a flat pilaster, suggesting that the viewer is to imagine that the inset panels of the pilasters are really projecting half-rounds? Or possibly concave (which would fit better with the pendant at the top of the panel)? Simple semi-circular windows provide ample light to banking hall.